This was an article for a talk that I gave about ten years ago when my youngest was two years old - how fast time goes by! Subhanallah, some of the things about my children I had forgotten. If your children are young, enjoy them at that age. Be with them and nurture them and your relationship. One way to nurture is to respond to your children without screaming. When I was asked to talk about this topic I was a bit reluctant. If I was approached several years earlier I would have been glad to share my experiences. My first child had an easy temperament. He would stop acting up if I frowned and turned away from him. We had a close relationship and he always wanted to please me. I constantly praised him for good behaviour, I taught him empathy and rules to follow. 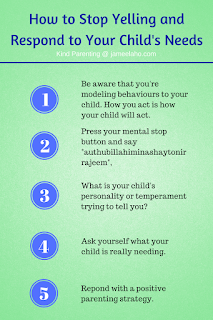 These are some of the methods that I used to guide my son’s behaviour. I did not have to shout. Does this sound too perfect to be real? I didn’t think so. I thought it was easy and anyone could do it with their child. But this was before I had my second son. It was a different story with him. Everything I knew and did, did not worked. I tried other more drastic methods but they did not worked either – I tried time out, but this was too dangerous because this child had a temper and he would kick the door or banged against the door until he was hurt. He was stubborn too so he wouldn’t stay in his time out corner if there wasn’t a door to stop him. I was at the end of my rope so I resorted to the method that was instantly gratifying to me – I shouted, I screamed, I yelled, I ranted and I raved. After that, it made me think. I wasn’t being a good role model for my sons. My eldest had started to yell at his younger brother and my youngest son was not learning to control his own screaming and being patient. By yelling at him I was reinforcing his yelling. But saying, “I’ll try to be more patient and not shout and yell anymore” proved too hard to follow through. It’s that moment when anger seizes you and you blindly react to it that is the hardest to control. We are strong because it requires a lot of our self-control. Yet if we could do it then it will be one of our greatest achievements. Prophet Muhammad (peace be upon him) said that the most beloved thing to Allah, the Most High, is anger which is controlled (by His believing slave). How many of us know this but how many of us do stop to say it? It is very hard to think about doing the right thing when we are in the midst of our anger. So how do we put this knowledge into practice? The key here is to actually STOP ourselves. Stephen Covey in ‘The 7 Habits of Highly Effective Families’ hit the nail on the head when he wrote that ‘What we all need is a “pause button” – something that enables us to stop between what happens to us and our response to it, and to choose our own responses.’ (p.29). What this means is that when your child does something which angers you, instead of reacting angrily to it, you mentally press your pause button – I will call it the stop button because it is more effective to mentally tell yourself to stop then to pause. So in your mind, tell yourself and force yourself to STOP reacting, then say, “a’uthubillahi minashaytonirajeem”. After you have done this you will find yourself calmer and able to think more rationally and respond appropriately. One reason why we shout and yell is because of frustration caused by us not understanding our child or his actions. This often occurs when our child’s temperament or personality does not match ours. My eldest son’s temperament matches mine exactly – we’re both quiet and sensitive – so I understand him perfectly. We are so in tune with each other that I understand what his needs and wants are and can respond appropriately to them. But my second son has a completely opposite temperament to mine. He is active, sociable and independent. Not only did I not understand his needs and behavior, I found it very difficult to deal with. Let me give you another example. The same son became frustrated very quickly when he couldn’t do something himself. When he couldn’t do a puzzle piece, take off a lid or connect a toy he would scream and throw the thing. I would get upset with his behavior so I started to shout at him to stop it and put the puzzle in place or open the lid or connect the toy for him. I had thought I had helped him and that he would be pleased. But no, he screamed even louder – this lead me to yell even more at him for his unreasonable behavior. It was a downward spiral. Then when I realized about his need for independence I would show him how to do it or do it halfway and let him do the rest. He was happy with this because the end result was that he did it himself. To understand your child requires a lot of patience in more ways than one. Sometimes I just want to put his clothes on and quickly go out the door or open his lid quickly and give him his drink. But patience is also required to figure exactly what he wants. I know his need for independence but sometimes all of a sudden he’ll be upset for no apparent reason. This is when I have to do some detective work to figure out what the problem is. This requires a lot of patience, especially for a ‘Terrible Two’ who does not have the language or the patience himself to explain his needs. Patience is also required because our personalities don’t match and we wonder why in the world he needed to do that. So we have to be patient and let him get on with it. Another reason we shout and yell is because we don’t have the parenting skills to deal with our child. Our child doesn’t listen to us and so we become frustrated. We don’t know how else to react and so we resort to yelling. Once we have knowledge of the different methods available we can choose the appropriate one to use. I have compile the different types of strategies that you could use into a book called ‘Guiding Children’s Behaviours’. To read more about it, click the link. 1. When we shout, scream or yell, we are modeling this behavior to our children. They see us doing it and they think that it’s ok to do it also. 2. To control that moment of anger before we shout, scream or yell, we must mentally tell ourselves to STOP, then seek refuge with Allah by saying, “a’uthubillahiminashaytanirajeem”. 3. Understand your child’s temperament/personality and have patience with it. 4. Figure out what your child's need is. Ask yourself what it is that your child really wants. 5. 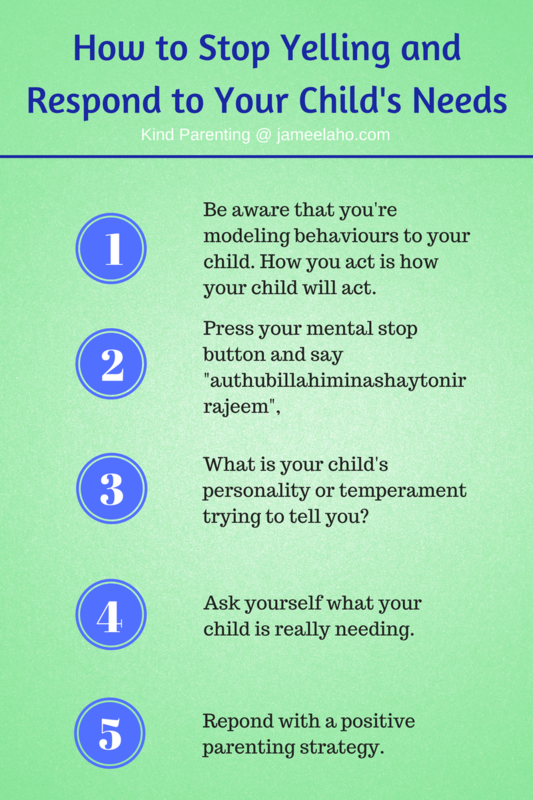 Use parenting strategies to guide your child’s behaviour and react without shouting, screaming and yelling. Related article: Read more on not disciplining while angry.